I recently had my annual eye exam and found out that late night reading in low lighting had caused my vision to deteriorate further. I have been looking for a good quality reading lamp and found the perfect one online at Destination Lighting®. The 5-Watt LED Reading Wall Lamp ($69.95) from Destination Lighting® is not only practical but it is very stylish too. With a modern satin-nickel finish it is a nice addition to our living room. I appreciate that it is a smaller size so it doesn’t take up a lot of space and it is adjustable so it provides bright light in the area making reading a pleasure. 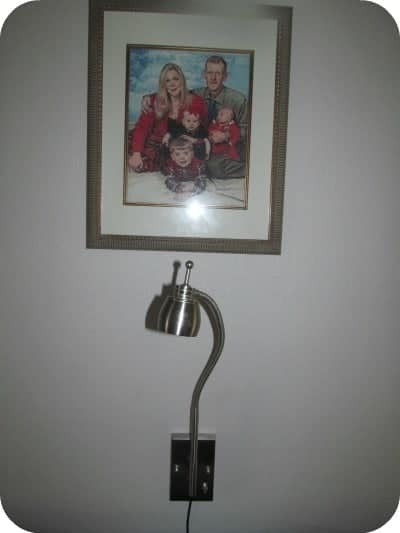 It was very easy to install on the wall and all of the necessary hardware was included. Simply plug it in and switch it on and I am ready to enjoy an evening of reading! Destination Lighting® is an excellent online resource (retail stores located in WA and OR) for indoor and outdoor lighting. From ceiling lamps, chandeliers, wall lights, pendant lights, desk lamps, ceiling fans and more…..Destination Lighting® has a wide selection to choose from in a variety of styles, brands and price points. If you are looking to redecorate or update an entire room then you will want to check out the selection of stylish home décor too! There are lots of holiday gift ideas too including a few of my personal favorites such as the Blue Moon Tiffany Table Lamp ($89.96 sale price) and the stunning Five-Light Chandelier ($329.00). My husband has wanted to get new outdoor lighting so a pair of the 15-inch Outdoor Wall Lights ($59.95) would be a Christmas present for him. You are invited to visit Destination Lighting® and shop their online store for all of your lighting needs and there are a variety of price points for virtually every budget. I am very pleased with the quality and value of the reading wall lamp and look forward to updating other lighting throughout our home. My favorite lamp in this collection is the Hamilton Decorative Desk Lamp. Thank you for the chance to win. Happy holidays! I like their led desk lamps. Their is one for $195 that I like in particular. BLUE MOON TIFFANY TABLE LAMP is a WINNER. I like the modern 3 light drum pendant with cream shade. Thanks for hosting! The http://www.destinationlighting.com/storeitem.jhtml?iid=278394 is really pretty! I love the 20-Inch Tall Modern Rectangle Table Lamp! The Stelle Sconce would fit so well in our master bedroom. Stasis Table Lamp is very cool looking. I like the colored track & rail lighting. I like the linear floor lamp with tray. I really like the Compact Fluorescent Floria Floor Lamp. My favorite is the Olympia Three-Light Pendant Light. I would love the Adjustable Pharmacy Floor Lamp to put beside my recliner. Thanks for this contest! I love their Red Poppy Lamp….so nice!